Standoffs are separators of defined length, used to join two components and hold them at a given distance from each other. Female to female standoffs are comprised of a hexagonal or round (cylindrical) shaft, with an internally-threaded opening at each end; fasteners are attached via these openings to hold the assembly in place. In electronics applications, female to female standoffs are most often used to elevate a PCB above another component or surface. RC Fasteners & Components is your source for superior quality female to female standoffs at competitive prices. We offer both hexagonal and round standoffs. 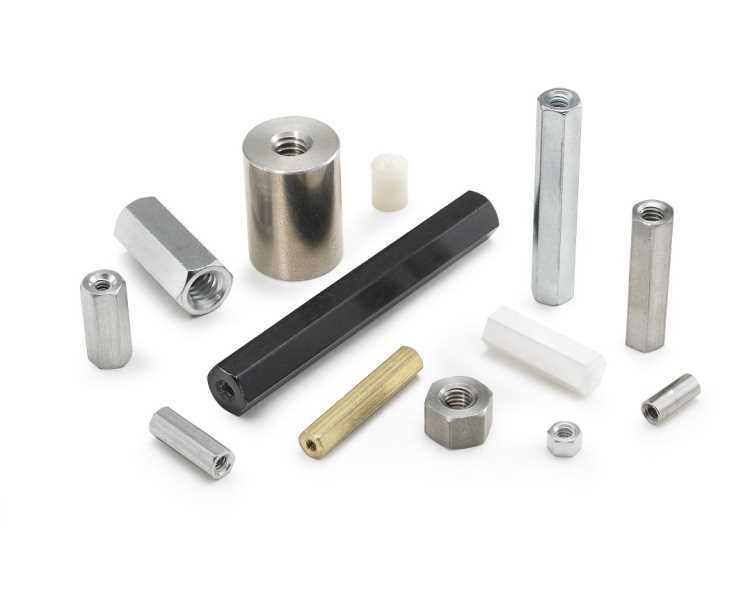 Hex standoffs are the more popular option, and cam be installed with a nut setter or other wrenching device; round female standoffs are preferred for applications where wrenching is not required. Our female to female standoff inventory includes a variety of sizes/lengths (including metric sizes), materials (see below), and platings to meet your needs. We have the standoffs you need at competitive prices that will keep you coming back! Aluminum is popular for its excellent strength-to-weight ratio. It is non-magnetic, performs well in severe temperatures, and offers electrical insulating properties. Brass is used in making high quality standoffs. It’s conductive, resists corrosion, and is non-magnetic. It is costlier and heavier than aluminum and is usually plated with zinc or nickel for enhanced corrosion resistance. Nylon is a good insulator and has a surface smoothness which will not fray the insulation of wires that rub against it, making it an ideal material for standoffs. Stainless steel offers many of the same advantages of brass, but with even greater resistance to corrosion and chemical fumes. Steel is used for standoffs that require greater strength. However, it is heavier than aluminum and does not resist corrosion like aluminum, brass, or stainless do. RC Fasteners & Components stocks hex and round female standoffs, male to female standoffs, and other high quality electronic hardware products. Order today, request a quote, or contact us to learn more.